Until we flip the calendar to that page in time, there are all kinds of cool tools and tech that can help real estate agents manage transactions electronically. And with something like Shoeboxed, you can also manage all the paperwork that manages you. Shoeboxed is a ones and zeros version of the shoebox you use to store and sort receipts, expenses, business cards and mileage notes from your year in real estate. Every showing, listing presentation over costly coffee, and networking event entry fee leads to an annoying accumulation of tiny paper reports that you need to prove you’re doing things above the line. If you’re like me, they usually hang around the wallet until you’re just short of Costanza-level, back-aching thickness. In my opinion, the coolest feature of Shoeboxed is its Magic Envelope. When you sign up, the Magic Envelope (an actual mailer) can be shoved full of all the miscellaneous receipts and reports and then hurried off to Shoeboxed. They’ll organize its contents for you and make sure it gets entered properly into your account profile. The shipping is free both ways. Slick, right? When using it on your phone (iPhone or Android), Shoeboxed uses the device’s camera as a scanner, extracting the most pertinent data from your receipts and business cards. For the former, it grabs the date, amount, vendor, and payment type. You can later edit if needed. The data file is created in your account, later to be used in monthly, quarterly, or annual expense reports, as well as for taxes purposes. It also categorizes the expense for you. Was it lunch with a client or the cost of a continuing education course? Shoeboxed allows users to send email receipts via Gmail directly into the system by simply forwarding them to receipts@shoeboxed.com. I can’t tell you how many email payment confirmations I have starred, flagged and marked as unread floating all over my ten active email inboxes. (Seriously, ten.) If you use TripIt.com to organize your travel, then you know how awesomely useful this functionality can be. Mileage tracking can be tedious. I’m sure you’re familiar with having to jump on to Google maps at the end of the day to manually enter the addresses of the ten properties you visited so you can total your mileage. That’s fun. Don’t forget a trip to the sign shop. You may notice that Shoeboxed gives you multiple methods by which to get your information into the system. I think it’s best to use one method for each form of data and stick to that. 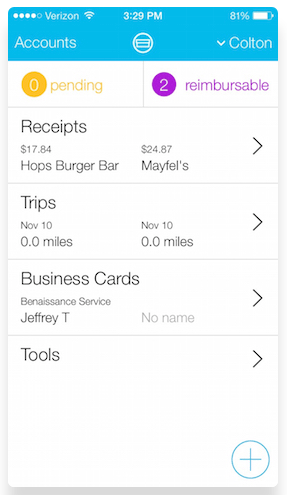 Use the app for mileage tracking, the email forwarding for electronic receipts, and then the Magic Envelopes for all the paper. In short, the more you can leave up to them to do for you, the better. The business card data extraction is cool, but why use yet another tool for contact information? I’d leave them out of your shoebox. I wouldn’t worry about it. Shoeboxed has a number of pricing models. The free version gives one user five documents a month by electronic submission only. As you go up in price, you get more documents to submit, more users, and more Magic Envelopes. If you’re a busy agent team of two, I think the Classic plan is worth considering. Bigger teams and firms can shoot for the Executive plan at about $83 per month. I don’t think Shoeboxed will change the way you sell real estate. But it sure can help you handle all the paper-based minutiae that comes with being an independent contractor. I can’t tell you how much I would love for a person to just storm into my home office every day to sweep up all the bits of tax-deductibleness that ends up everywhere except where it should be. I found a lunch tab from 2012 the other day. To be frank, nothing makes me happier than paying my accountant. I don’t even blink when I get his bill. Anyway, if you need help getting beyond the paper clips and staples, look into Shoeboxed.com. Do you use Shoeboxed? What do you think? Leave a comment and let us know!